President of the Republic of Azerbaijan Ilham Aliyev has received Minister of Energy, Industry and Mineral Resources of the Kingdom of Saudi Arabia Khalid Abdulaziz Al-Falih. The head of state thanked Khalid Abdulaziz Al-Falih for participating in the meeting of the OPEC+ countries in Baku. President Ilham Aliyev said the world`s first-ever mechanically drilled oil well was drilled in Azerbaijan, adding that Baku’s hosting the event has a particular meaning. The head of state noted that cooperation in OPEC+ format plays an important role in balancing the global oil prices. Minister Khalid Abdulaziz Al-Falih extended the Custodian of the Two Holy Mosques, King of Saudi Arabia Salman bin Abdulaziz Al Saud’s greetings to President Ilham Aliyev. He underlined Azerbaijan’s active involvement in OPEC+ format, and hailed the hospitality shown to the event participants in the country. Praising President Ilham Aliyev’s leadership in establishing OPEC+format, Khalid Abdulaziz Al-Falih described Azerbaijan as an active participant in this format. Pointing to the bilateral relations, Khalid Abdulaziz Al-Falih expressed his country’s full commitment to the restoration of territorial integrity and sovereignty of Azerbaijan, which was violated as a result of aggression. He noted that Saudi Arabia follows with great interest the work done towards strengthening of Azerbaijan, its economic development and diversification of economy. Khalid Abdulaziz Al-Falih emphasized that during the visit to Azerbaijan, the Saudi Arabian delegation had fruitful discussions with members of the Azerbaijani government and business community. 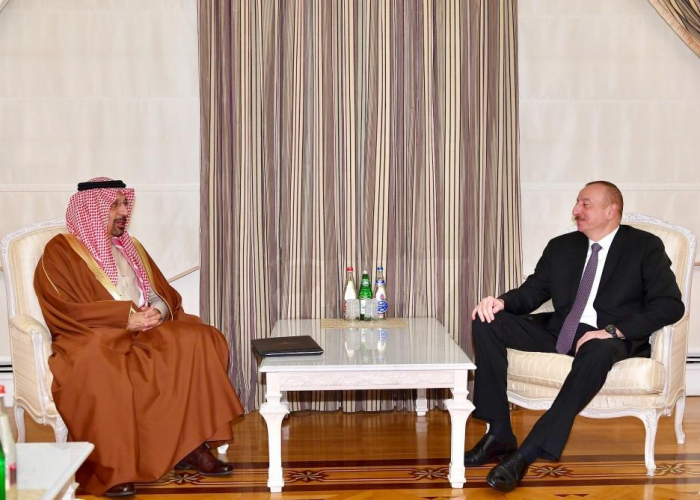 President Ilham Aliyev thanked for the warm words and greetings of the King of Saudi Arabia Salman bin Abdulaziz Al Saud, and asked the minister to extend his greetings to the Saudi King. President Ilham Aliyev hailed bilateral relations between the two countries. The head of state commended the Kingdom of Saudi Arabia for constantly supporting Azerbaijan’s fair stance on the settlement of the Armenia-Azerbaijan Nagorno-Karabakh conflict, describing this as a sign of friendly relations between the two countries. Praising the development of the bilateral political ties, President Ilham Aliyev highlighted ongoing work to diversify the economy in Azerbaijan and Saudi Arabia, and noted that it creates good opportunities for the expansion of economic cooperation between the two countries. The head of state pointed out the growing number of the Saudi tourists arriving in Azerbaijan, saying this contributes to bringing the two countries and peoples closer to each other. President Ilham Aliyev thanked for the warm words and noted that the Saudi Arabian people who visit Azerbaijan see the hospitality and the friendly attitude of the Azerbaijani people. The successful development of bilateral relations between Azerbaijan and Saudi Arabia in various areas, including in energy sector was emphasized, the opening of the office of Saudi Aramco in Baku was hailed at the meeting. The sides also exchanged views on prospects for cooperation between the two countries.